There are a few forms of generating alternative energy. Even a small effort can yield good results. For example, running wiring out to a small shed or barn can often require inspections, certificates and trained professionals. By using a small, localized alternative energy system, one can often avoid the additional costs and efforts required. This section highlights our experiences with solar or photovoltaic (PV) systems. The cost of these systems have been dropping drastically over the past few years. We have been able to completely isolate a feed room, watering system and milking room from the standard alternating current (AC) used in our house. First and foremost to understand is that a solar powered system is most efficient if the system runs completely on direct current (DC) voltage. Solar panels generate DC power that can be used to charge a battery. The battery holds the power until you require it to run a device such as lights or pumps. The key in designing a system is to know how much power you will require from your system in a typical day and to ensure that you have enough capacity in your batteries to meet those demands. The solar panels have to provide enough power to recharge the batteries before they are drained completely. It is highly recommended that energy-efficient lights - compact fluorescent lights (CFLs) or light emitting diodes (LEDs) - be used as they put less demands on your solar system for the amount of light (or lumens) produced. The heart of any solar power system is the battery and the charge controller. The charge controller is the little yellow and black box behind the battery. It's job is to accept the power from the solar panel and use it to charge the battery. When the battery is fully charged, it stops charging. Some solar panels known as trickle chargers come with a charge controller built in and can be connected directly to the battery without an additional charge controller. This works well with systems that have a very light load that is placed upon them or that are only used periodically. For systems that are going to see more use, the panels are often not equipped with a charge controller; therefore, you will need to purchase one. They are pretty affordable, but be sure that they are rated to handle the power generated by the solar panel(s) and that required by the battery system. The battery shown is a deep cycle marine lead-acid battery. At a minimum, the battery used should be a deep cycle type of battery. Deep cycle means that it will continue to provide the same amount of power as it is drained and that it can handle the multiple discharges and recharges that may be placed upon the system. The key to remember is that the batteries have to provide all the power you require when the system is not being recharged. There are a few factors that can directly impact the recharge cycle: seasons and weather. In the northern hemisphere, the sun is lower in the sky and provides less recharge time than during the peak of summer. Also, the number of cloudy days can impact the effectiveness of receiving a full charge. It is usually during these times, the greatest demand is put upon the system. The solar panel is responsible for keeping the solar power system fully charged. The panel shown on the right is a 15W panel. If more panels are required to meet the demand of the system, they can linked together in either a serial or parallel fashion. There are trade-offs with linking multiple panels together. In a serial fashion, the voltages add but the current will always be based upon the worst panel. In parallel, the currents add but the voltage will always be based on the worst panel. If a single panel can be found to meet your needs, this will provide the best return on your investment. If not, then try to minimize the number of panels you require and make sure all the panels have exactly the same exposure to the sun. A tree blocking one panel can greatly reduce the efficiency of your system. The great thing about running a 12 volt DC is that there are a lot of things built to support running on 12 V DC. The recreational vehicle (RV), boating and automobile industry is all based upon using 12 V. The CFL light panel to the right was purchased from an RV outlet store. The wire used to connect to it is 14 gauge, but one could easily use a stranded 18 or 20 gauge wire. Just be sure to use a gauge of wire similar or thicker (lower number) than that used by the connected device. 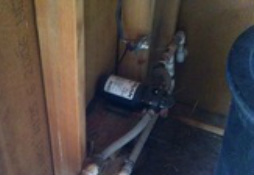 The watering system used to provide collected rainwater to the goats and chickens uses a pressure sensitive 12 V DC pump. The pump maintains a preset pressure in the line. When the animals drain from the float controlled tanks, the pump senses the decrease in pressure on the outlet and the pump kicks in to maintain the pressure. When the pressure is reached on the outlet, the pump automatically shuts off. The wire gauge on this pump was 14 gauge which is why our system uses 14 gauge wiring throughout. There is a simple single-pole light switch (similar to what is used in the house) above the pump to act as a power cut-off in case there is a break in the water line or there is a need to shut off the pump to clean or replace the filter.